The supplement contains information pertaining to the VP Commodore range introduced in October 1991 and the Series 2 VQ Statesman and Caprice models which were introduced in January 1992. 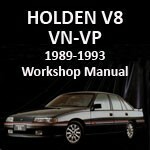 In October 1992, the VP Series 2 Commodore was released and the VQ Series 2 Statesman models were updated. Refer to this supplement before commencing any work on the vehicle to ensure that the correct procedures and specifications are beig used on the particular vehicle. Procedures not mentioned in this supplement remain unchanged from the main part of the manual.